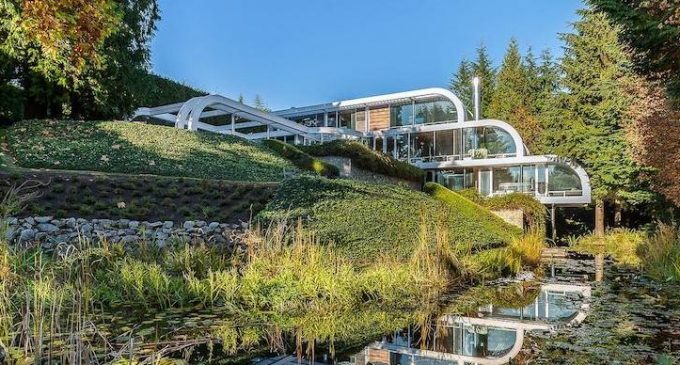 Described by architect Arthur Erickson as his “most complete work”, West Vancouver’s famed Eppich House 2 is sure to impress. Erickson designed the one-of-a-kind steel and glass home in 1979 for Hugo Eppich, co-founder of Ebco, a heavy machining and fabrication company. All the furnishings were also designed by Arthur Erickson & Francisco Kripacz and manufactured by Ebco Industries. Hugo, who still owns the property, has preserved the home so well that it appears as it did when Erickson handed over the keys in the late-1980s. There is more than 7,000 square feet of space spread over three terraced levels with four bedrooms, four bathrooms, curved walls of glass block, a modern kitchen and a lounge opening out to a early infinity edge swimming pool. According to Arthur Erickson’s website, “A creek bordering the south end of the site was diverted to create a reflecting pool completing the series of pools on each terrace above.” The Eppich House 2 is somewhat of a local landmark but even more so on a global scale, the home has been featured in a variety of design magazines as well as film. Arthur Erickson was undoubedbly one of Canada’s greatest architects, creating many homes and buildings in Western Canada that still stand and inspire today. Erickson also designed structures in Alberta, Ontario, California, Washington and England to name a few. This is the first time this Canadian masterpiece has been available for sale. The Eppich House 2 is on the market for $16,800,000 CAD with Sotheby’s International Realty.